Ernie’s time began in 1874 as a twin born into a pioneering family in country Victoria, Australia. Ernie Old’s life long passion was the bicycle. He also ran a business as a blacksmith, was a Boer War veteran and survivor of the World War 1 Gallipoli trenches. During the Great Depression he invented a successful car part which he could easily manufacture in his blacksmith’s shop. Enduring the hardships of the depression years Ernie never relied on handouts for his family to survive, thanks to his patented steering stabiliser. Ernie was in his late 60’s when World War Two began and his request to join the Australian army for a third war, was rejected. Aged seventy three in 1947, Ernie entered for an eleventh start in the Warrnambool to Melbourne cycling road race, his first start in that race was in 1901. The sponsors rejected Ernie’s entry to the 165 mile Warrnambool road race, citing that Ernie was too old. Ernie being a public cycling figure would attract too much attention and detract from the main aim of running a road race. Earlier in 1945 at the age of seventy one, Ernie began a series of solo trans continental bicycle rides, imprinting his love of the bicycle into the rough bush tracks and roads of Australia. 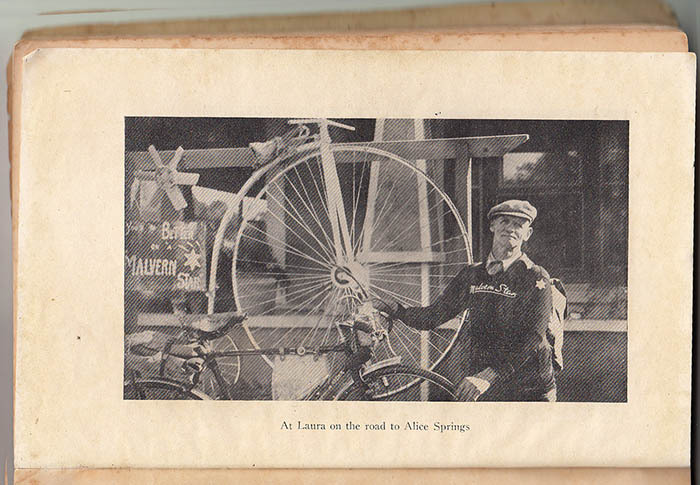 With daily averages totalling more than one hundred miles, Ernie was still riding bicycles across Australia, aged eighty when he undertook a six thousand four hundred mile ride with minimum daily miles of eighty for eighty days. This is the spirit which made Ernie Old a favourite Australian adventurer of the twentieth century. Ernie Old - By Bread Alone, this is the cover of the well worn copy which belonged to Arthur Dows and now remains in the Joe Cosgrove cycling archive. Hardman Brisbane cyclist Arthur Dows was an Ernie Old fan. Arthur Dows’ crumbling brown paperback copy of Ernie Old’s book “By Bread Alone”, has been handed around the Australian cycling fraternity for decades. Arthur’s well read book came to me with Arthur’s warning still inscribed inside the back cover, “LENT . OUT BY COMBACK.” Sic. Knowing Arthur’s reputation for violence no Australian cyclist was going to keep Arthur’s copy of the book detailing Ernie Old’s life story. You can understand a steely old school bike rider like Arthur enjoying a taste of what it was like to begin bike racing where previously there was no bike racing, just decades of hardship building a new nation. Arthur Dows’ copy of Ernie Old’s book makes the reading all the more special. Arthur himself is pictured in one of the photographs as an admiring fan in the back row of Ernie’s 1947 visit to Brisbane, the first time that Ernie rode from Melbourne to Brisbane and back to Melbourne. Arthur’s unmistakable head has an “X” struck through it with the initials above .. A.D. Nine other bike riders were in the crowd who’ve also been “initialled on the head” by Arthur. There's Arthur Dows in the back row on Ernie's visit to Brisbane. With his mark clearly showing as A.D.
Arthur Dows’ collection of cycling memorabilia (now in Joe Cosgrove's care) has just about every page of every document defaced by Arthur’s pen. Two pages of Ernie’s book, singled out by Arthur told how Ernie trained for riding and which type of gearing Ernie used in the Warrnambool to Melbourne road race (block chain, one inch pitch). Then there were passages which would appeal to the hard bike rider mentality, one about weak minded men who were slow at binding sheaves of wheat, and another about boarding a ship for the Boer War where Ernie seemed pleased that there were no women present to weap on his shoulder. “So if the binder was lazy, slow, or unskilled, a large number of unbound sheaves would brand him for what he was, a poor weakling, unfit as a mate for a real man.” Ernie Old on contracted farm workers. “No broken hearted girlfriends were there to weap on my shoulder, so I had no worries of that kind, having been too busy bike racing to have spare time for society.” Ernie Old upon leaving on a troop ship for the Boer War. Cycling in Australia when Arthur began racing in the 1930’s was a different place to the Australian cycling scene we know today. The 30’s was an era of long distance records over hundreds and thousands of miles, along roads which today would be considered bush tracks. When Arthur Dows began riding there were two tracks you could choose, the left or right wheel track, or even a fully paved road. Back in Ernie Old’s first days of cycling there were three tracks, two wheel tracks and the middle track made by the hooves of horses. Arthur Dows made his own special mark on Ernie Old's book. Ernie Old’s story is a first hand account of what it was like to become a cycling enthusiast in a time when cycling was at the beginning. Ernie was born into a pioneering family, living in an isolated Victorian rural community, when he was eleven years old he’d never seen a bicycle before … then one came rolling along the road, Ernie’s destiny had arrived. “One memorable day I was on the road in front of our house when I saw a bright flash of sunlight on something new and strange coming along the road. Soon a man appeared in the road about half a mile away, with no visible support under him. As he turned a little this way and that, there came the same bright flashes which I had first noticed. He came swiftly nearer and soon I was able to see that he was riding on a tall, graceful wheel with a little one trailing behind. Soon the rider reached the house, swung down from his high seat and asked me for a drink of water which I hastened to get. John Bange the fanous picture of his racing track at Aviadel in south east Queensland, a similar style of track to the one the Old brothers would have built. In 1901, aged 27 Ernie thought he’d get into road road racing and entered for his first 165 mile (265 km) Warrnambool to Melbourne road race. Note : (If you’re familiar with the course being Melbourne to Warrnambool, it was run in the opposite direction from 1895 until 1938. The first edition from Melbourne to Warrnambool was run in 1939 “Held for the first time in the opposite direction i:e from Melbourne to Warrnambool, as a compliment to the citizens of Warrnambool, who, this year, are celebrating their city’s centenary. The first Warrnambool dates back to 1895.”Huon and Derwent Times (Tas. : 1933 - 1942), Thursday 5 October 1939, page 2. Times recorded in the late 1930’s when roads had been improved were around seven hours and forty minutes for the 265 km, back in 1901 the time to complete the course was around nine hours and twenty minutes. Ernie didn’t just front up at the start line at Warrnambool in a motor car, like many he rode from his home, in Ernie's case from near Swan Hill. First to Melbourne, he stayed there for a couple of nights then rode to Warrnambool ready for the return journey wearing a race number. The field back then consisted of all types, there was even a pipe smoking shearer who’d entered. Ernie wrote “One of our party was an elderly shearer, who rode his cycle from shed to shed. He liked to sit down and smoke a pipe every 40 miles or so, and said ‘I’ll have to sit down to smoke two or three pipes in the race’.” This was right in the middle of the bicycle riding shearer boom. Shearers who rode the entire length and breadth of the continent on purpose built shearer bicycles, following remote camel tracks, traversing deserts and plains, along dusty stony roads looking for back breaking work in Australia’s shearing sheds. Ernie’s first hand account confirming the shearer’s love of sports and bicycle racing in particular. Ernie Old's blacksmiths shop at Dingee, if he wasn't working here he was out riding a bicycle. Ernie reached his mid fifties when the Great Depression began, during these hard times he didn’t just sit about. He’d been a digger in the Gallipoli trenches so got his old Light Horse mates together again. “I still had my horse, and set about recruiting our Light Horse troop, which the war had broken up. We soon had another good troop, and in a few weeks were fully equipped and enjoying our drills and camps again.” At the same time Ernie invented his patented steering stabiliser and rode up to a hundred miles on his bicycle fitting two or three stabilisers per day. Not one for getting things done in half measures, as well as organising the light horse reunion and delivering his blacksmiths shop production from his bicycle, Ernie decided to enter the Warrnambool to Melbourne road race, in his late fifties he was still riding the race within a nine hour time limit for the 265 km distance and repeated this feat a total of ten times the last when he was in his early 70’s. In his last start Ernie was also one of only 76 to finish within the time limit, out of 320 starters. Ernie’s usual routine for training when not on his long distance rides was to cover about twenty miles per day (32km), preferring to ride himself into fitness while covering thousands of kilometres. Ernie Old, method of training for cycling as noted by Arthur Dows. In 1945 aged seventy one Ernie “lit out” for Sydney and nine days later returned to his job in a Melbourne ordinance factory, where his co-workers took some time off for speeches and a cake cutting to celebrate Ernie’s 1,828 km adventure. Ernie soon became a national celebrity. When Ernie completed his 9,656 km ride to Adelaide, Darwin, Brisbane and return to Melbourne in 62 days, there were 75,000 people waiting to greet him at the Melbourne Showgrounds. At the end of his record rides many of Australia’s great long distance riders would meet Ernie and ride into town with him. Riders like HubertOpperman, Ossie Nicholson and Elsa Barbour. There was nothing new about riding bicycles across Australia’s boundless inland roads, the shearers had traversed every country trail, decades before Ernie. What Ernie added was a public face and the ethos that anyone who was getting on in their years could still get out and enjoy the benefits of the outdoors. One of Ernie’s tricks for covering vast distances was borrowed from riders like Ossie Nicholson. Back in the 1930’s when record breaking cycling, over vast distances was a favoured aspect of cycle sport, riders like cyclist Valda Unthank discovered that little or no sleep equalled more miles. Ernie’s rides began at the break of dawn and always ended sometime between 9.00 and 11.00 pm. Riding into the night on rough country roads relying on just the light from a dynamo powered headlight. One of Ernie’s rides that stood out to me was when he rode from Sydney to Brisbane aged 71, he covered the distance of 428 km from Scone in the Hunter Valley of New South Wales, over the hilly ranges of the New England Tablelands to Tenterfield, in one day. His story begins the night before, “Made up my couch under a spreading pepper tree on the roadside … woke up as dawn was faintly glowing in the east and went on my way. I went on to Tenterfield that day. I enjoyed the ride past the green hills with thick timber right up to the tops. Stayed the night at Tenterfield.”Anyone who knows the road from Scone to Tenterfield will know it would make you tired driving that road in a modern car! Luggage carried on Ernie’s bicycle weighed between fifteen to twenty kilograms, depending on which bike ride he was undertaking. Ernie was described as being “As strong as a whipcord, the Peter Pan of Cycling, and a tall wiry, sun tanned man.” One time he told a reporter that, “Life has been one big laugh and a man is as old as he feels.” Wearing a hat, long trousers, long socks, a long sleeved button up shirt and a Malvern Star wool pullover, cycling for entire days and into the night would have been a sweaty affair under the Australian sun. In his later years Ernie had a job as assistant green keeper at Box Hill Golf Club, when he returned home from his marathon rides he’d be back at work the next morning. He was still riding until a couple of years before his 88th birthday, when in 1962 he passed away suffering a heart attack. Ernie Old with his Malvern Star Semi racer bicycle. The Cyclo style three or four speed gear lever is fitted to the top bar. The old style bidon cages are mounted to the handlebars, these are not present on the bicycle at the National Museum. Ernie Old's feats on a bicycle over Australia's unrelenting land, at an advanced age, makes rides like L'Eroica look easy by comparison. Completed at a time of life when others would have been relegated to a nursing home. Enduring blazing heat, windstorms, floods, road blocks, rain and storms, repairing stone ripped tyres and tubes, with up to forty punctures on one stretch of the Nullarbor. Ernie even went without food and water for two days on his way to Perth on the western edge of the Nullarbor. None of this deterred Ernie Old from enjoying his journey through Australia …. “old, (bush) that one loves to come here to lounge and dream. The soft-toned Australian bushland with it’s grey-green smokey-tinted foliage …. misty rustling woods and pale sky.” ……….. Reading Ernie’s book you get a sense that he’d rather be nowhere else than camping out with his bicycle, lost in the middle of nowhere, in a country where he imagined that … Time means nothing here. 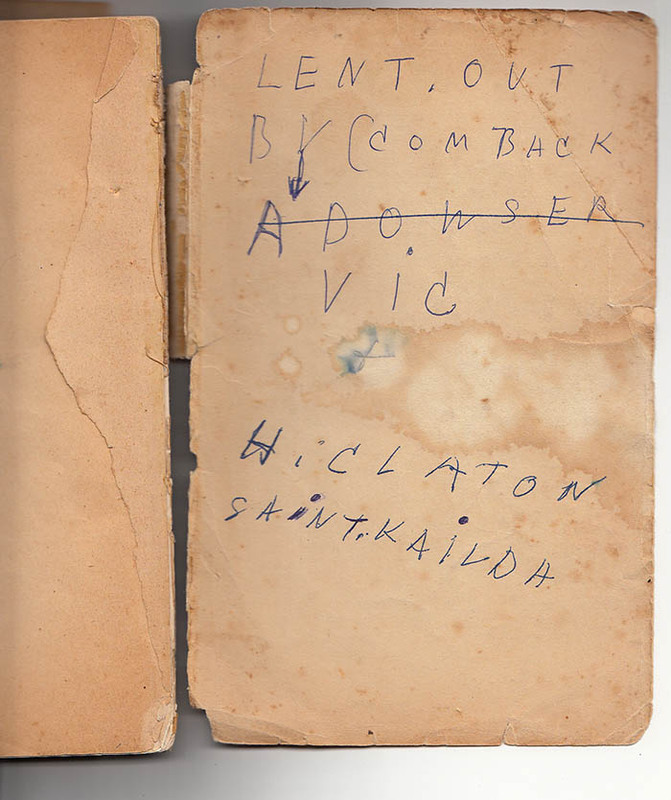 Arthur's dog eared copy of By Bread Alone, Ernie Old's auto biography, contains the names of some old well know Australian cyclists that Arthur has scrawled into the pages. One of Arthur's warnings to other cyclists, "Stolen from". A very well read copy of Ernie Old's book By Bread Alone. Ernie Old with two other cycling adventurers who were doing a reverse trip to Ernie's, when he rode to Darwin and back. The warning from Arthur Dows to return his favourite book, by Bread Alone by Ernie Old.